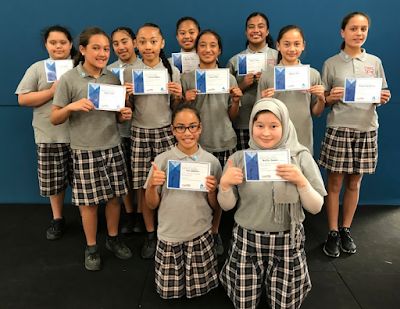 Today at assembly the girls who singed up for after school netball were finally given there certificates for coming 2nd in our grade. This was great to have came 2nd because we have had only won four games but it was all worth it in the end. I have enjoyed playing and representing Panmure Bridge School this year during the netball season. This was our netball team for 2017. My name is Jessie I am in Totara 2 at Grey Main School. I think that it is awesome that you were in your schools Netball team this year. I think that the fact that you came second in your grade is really cool and it shows that you know what you are doing. I personally had experience in this sport cause I played last year it was great fun. Kia Ora Shakaia, my name is Vanya and I’m a year 6 student from Paihia School. I like your photo of you and your netball team taking photo’s. I have been commenting on your blog and I did not know that you played netball. Your teams netball certificates look fantastic! I used to play netball and I loved it! And wow your team came 2nd. I hope you enjoyed playing for your team and I hope you had a lot of fun during the season. How long have you played netball for?